When the industry’s most pristine silicone ― formulated to meet strict regulations and powered by mass customization ― comes to skin care, the possibilities are endless. See the transformative results of formulating with CareSil’s Encapsulation Technology through our new, on-trend beauty routine. NuSil introduces CareSil, bringing three decades of global leadership and silicone innovation in the healthcare industry to skin care. Care isn’t just in our name, it’s in our DNA. It means knowing that high-end manufacturers of health and beauty products like you don’t just desire innovative solutions. You demand it. ►Products We’re bringing you the next generation of pristine, medical-quality silicone. Scientifically evolved and improved by NuSil over 34 years in the healthcare industry, our silicone is not only effective, but pure. And our numerous quality and environmental certifications ensures customers that we will develop leading skin care products, with the highest quality ingredients. 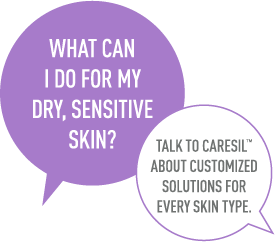 At CareSil, we know that beauty cannot be standardized. That’s why we create customized products based on individual skin types and your unique specifications. Mass customization is built into our workflow so we’re extremely agile. We can create the most unique products while providing extraordinary speed to market. CareSil is committed to creating your products, your way. Fortified by NuSil’s expertise in highly regulated industries, we’re skilled at working with the FDA and international regulatory agencies. Our proactive approach helps you create novel skin care products that are in compliance. Backed by NuSil’s vast network of offices and facilities in the U.S., Europe, Asia and South America, CareSil provides the scale and fulfillment you need. Our brand of care means we’ll be there for you, no matter where you are. where you are. Contact us at one of our offices across the globe.